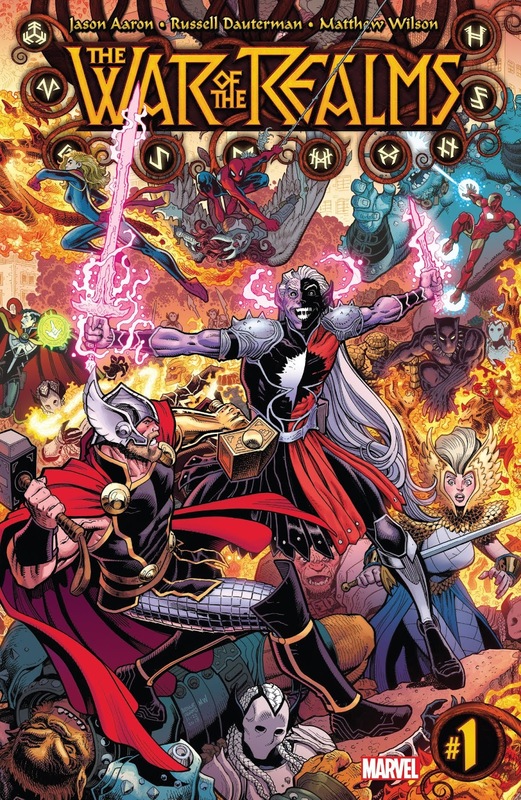 Welcome back, this is the first episode of War of the Realms storyline based on issue #1. The story begins on Asgard, Odin is sitting on his throne. We will talk about it in a minute. 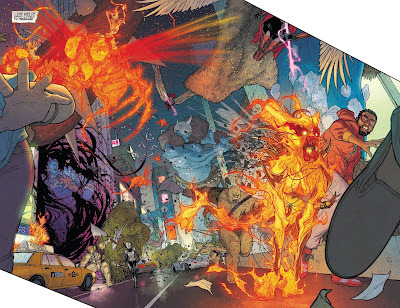 First of all, comment down below if you are excited for War of the Realms or not? 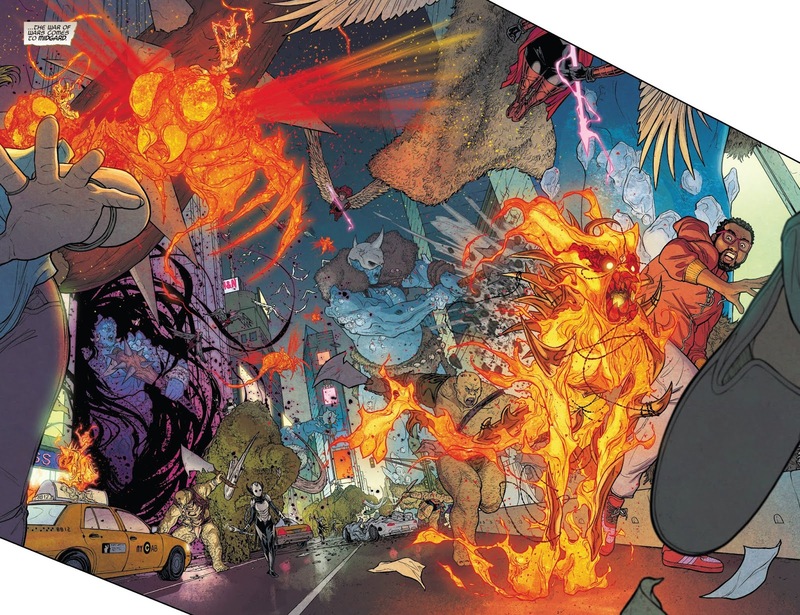 Now that you have done that, Let's get started with our first Episode of War of the Realms. War has been raging through the realms for many months. Many renowned places like The garden of the light Elves, Land of Dwarves are destroyed. The Gods of the Vanir are trapped in their own fallen temples. Including all these destruction, Asgard was no exception. Asgard is ruined, nothing left except shadows and dust. The Rainbow Bridge shattered into pieces, all Asgardian army ravaged and scattered. While all the realms are burning and enemies massing, Odin sits alone on his crumbling throne waiting for his Odin sleep which is not coming because he knows that a great and terrible ending is near. We see Odin sitting on his throne, talking to himself. He is saying that it was boring and restless to see so much silence in Asgard. Then he says that all the Gods fled to the land of Mortals including his son, Thor. Suddenly, Odin see a shadow in the darkness and ask, "Thor, Is that You?". Soon, It is revealed that it wasn't Thor but the Dark Elves who came to assassinate Odin. Odin becomes too furious and but he was weak and one of the dark elves managed to kill Odin. Then we see Odin screaming to death. 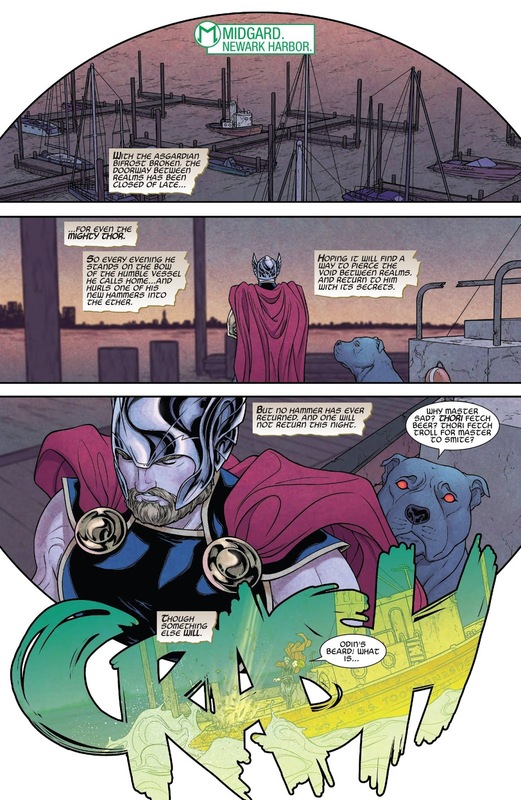 We see Thor and Thori (Pet Dog of Thor) standing on the Bow of the boat, and he is trying to call home (Asgard) but since there is no one in Asgard left to reply back, he never gets a reply. He throws his hammer to check for a void between the realms but everytime he fails. Thori is sitting behind Thor. And suddenly Thor sees Loki in front of him, lying on the ground. Loki was badly injured and bleeding heavily. Thor asks Loki that who did that to him, Loki replies that it was too late and the War of the Realms has started and it can't be stopped. Thor again asks for the name, and Loki says the King of the Dark Elves, Malekith the Accursed who was coming for Thor. But suddenly, one of the boat blast off and the Dark Elves appears. Thor calls his hammers and kill all the Dark Elves. Loki says that it was too late, Malekith will take down Odin, Thor then Loki himself and all other gods. Hearing this Thor ask Loki to stand up and take him to Malekith and end this war once and for all. Loki says that he doesn't know about the hidden place of Malekith, but Thor knew that Loki must be knowing about it as he has always been into wrong acquaintance. Thor picks up Loki and warn him that if he didn't tell the truth, then Thor would bury his hammer into the wounds of Loki. 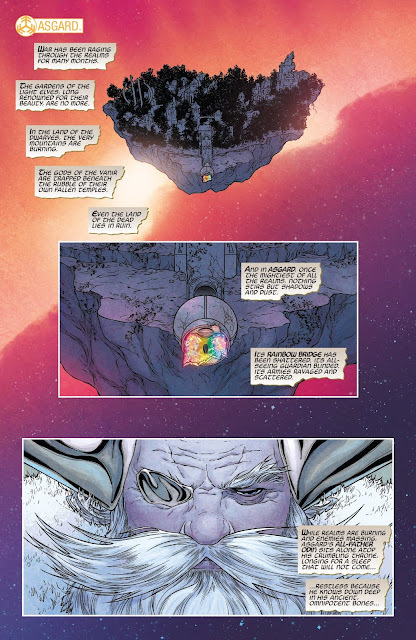 Loki agrees to take Thor to Malekith, and starts the void to teleport them. Meanwhile, Thor asks Thori to alert the Avengers. 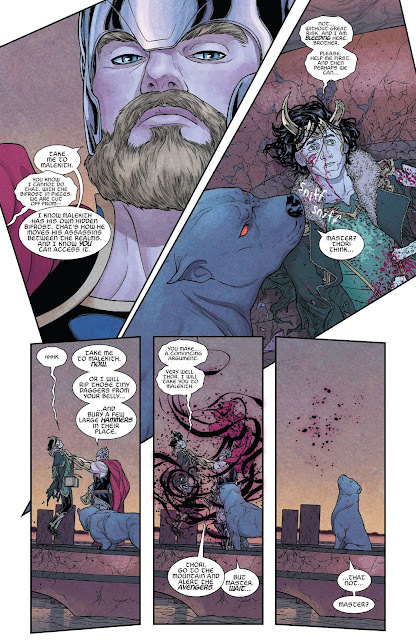 Thor thinks that Loki betrayed him and teleported him to Jotunheim, the land of Frost Giants. But soon it is revealed that Loki didn't betray him instead he took Thor to Malekith himself. 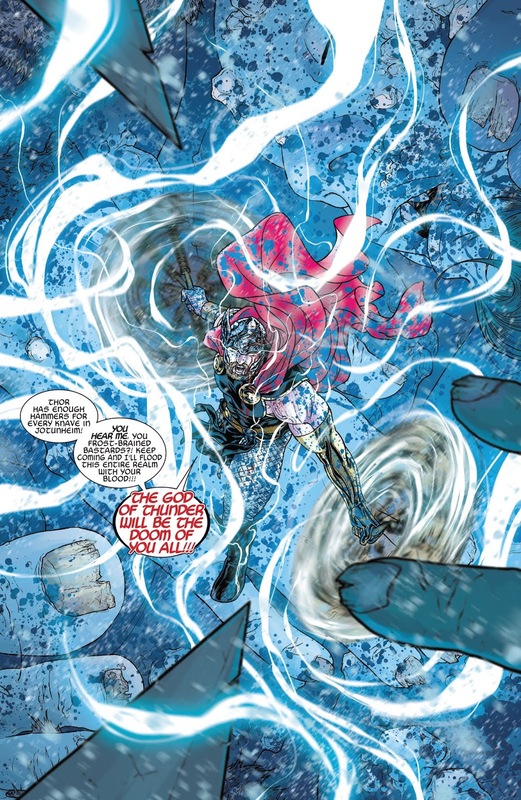 Thor sees Malekith standing in front of him and many Frost Giants standing behind him. 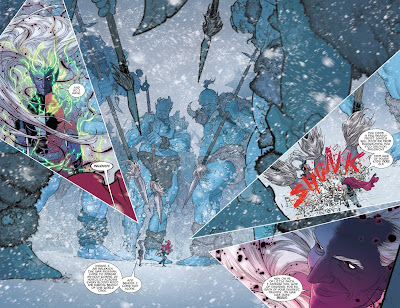 Malekith orders the Frost Giants to attack Thor and exclaims that it was just the beginning of the War. We see Spiderman swinging in the streets of the Bronx, suddenly his Spider-Sense activates and he notice some Dark Elves trying to assassinate Lady Freyja on a rooftop. 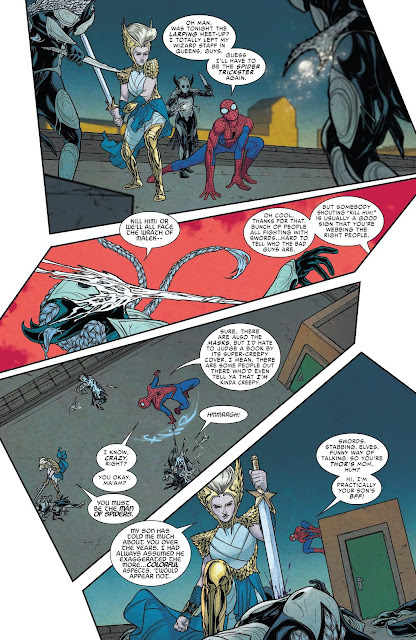 Spider Man lands on the rooftop, and both Lady Freyja and Spiderman kills the Dark Elves, then Freyja reveals that she knew Spiderman as her son Thor told her about him. Then the warrior three and Sif enters the rooftop from stairs to warn Lady Freyja but they come to know that they already defeated the Dark Elves. They tell spiderman that they have been living on Earth as refugees because their planet Asgard has been destroyed. Freyja reveals that the final war of the realms will not be fought on the land of elves, dwarves or giants but mortals i.e Earth. The war began in the Midgard as we see a troop of monster of in the streets of New York which catches attention of many Superheroes including Punisher. Punisher attacks a Giant, and other Dark Elves warns the people of that area. From the back, Daredevil appears and ask the Elves to leave the planet. 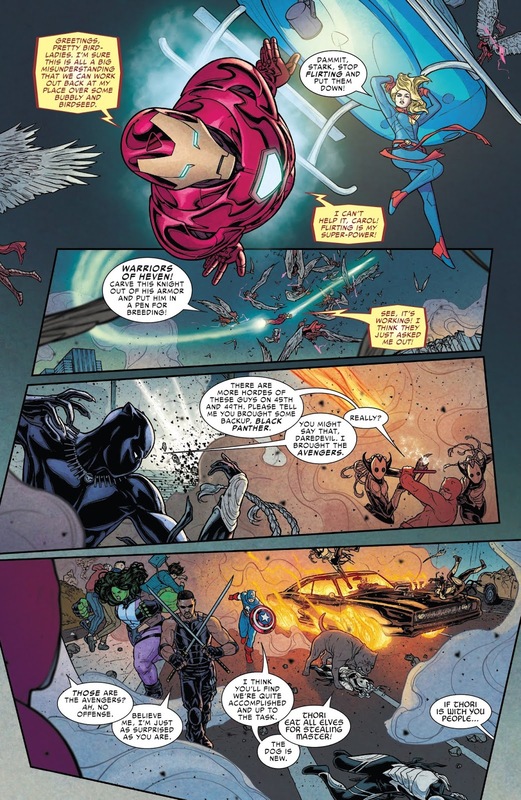 The War Angels attack a Helicopter but Iron Man and Captain Marvel come in between and save the Helicopter from crashing. We see Black Panther, who came to help Daredevil, but Daredevil asks him that there were a lot of enemies and they need backup. Black Panther replies that he already called up the Avengers. Then we see a intense scene in which we see many superheroes like She-Hulk, Blade, Captain America, and Thori. We then see Freyja, Spiderman, Sif and Warrior three. Freyja asks for Thor but no one knew where is Thor. Captain says that Thori said that he disappeared with Loki. Freyja understand that it was an act of Malekith. 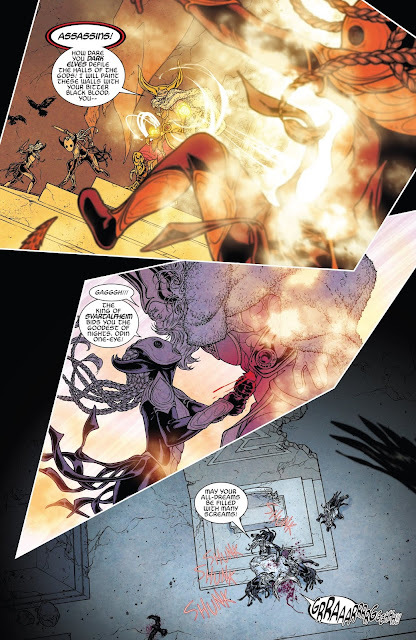 Then we see Malekith and all his dark armies consisting of the worst monsters the all the realms ever had. 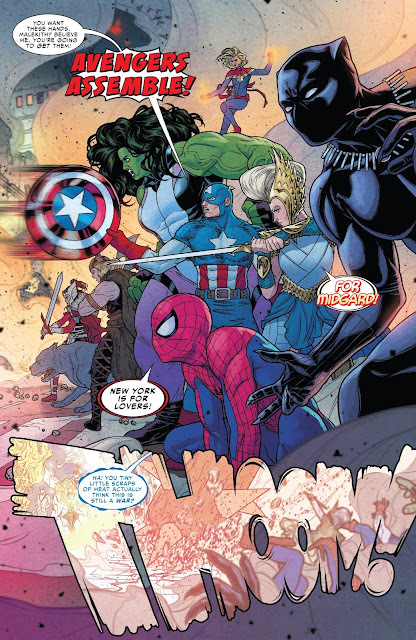 Malekith starts speaking and asks everyone to surrender to the new Lord of Midgard but Captain America throw his shield on his face to interrupts him. And Then Captain America says "Avengers Assemble"
The King of Frost Giants, Laufey picks up Lady Freyja in his hands and take his villainous dialogues but someone takes the advantage and cuts off the hand of Laufey. 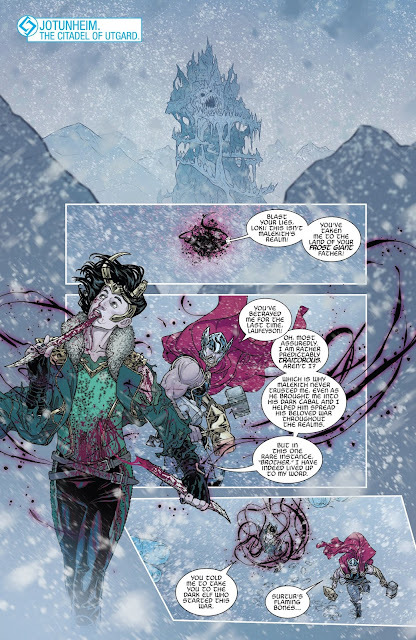 It is revealed that Loki cuts off the hand Laufey to save her mother Freyja. Malekith sitting on his bog Tiger attacks Loki and attempt to kill him but there is a superb entry of Doctor Strange who interrupts them by saying "ahem". Doctor Strange cast spells against Malekith. In the meantime Loki escapes the area and approach Lady Freyja to tell her about Thor. 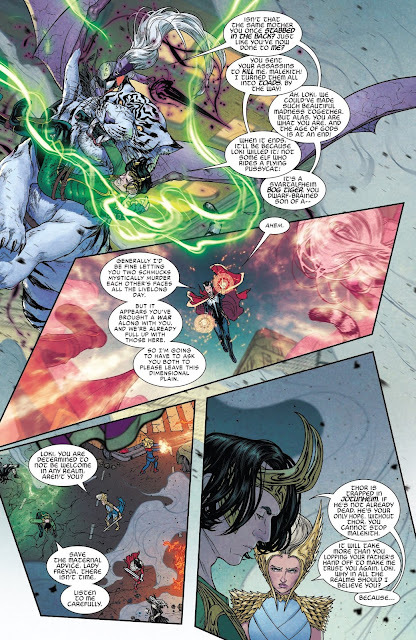 Loki tells Freyja that Thor is trapped in Jotunheim if he wasn't dead, and he is the only hope to to defeat Malekith but Freyja says that she doesn't trusted him anymore. Suddenly, Laufey picks up Loki and eat him alive. Everybody gets shocked at him, Laufey says that it was fair enough to his son because he betrayed him. Then a Strong Lightning strikes the ground and Thunderstorms started. Many Frost Giants and Monsters blown away in strong thunderous winds and we hear the voice of the God of Thunder. He says that it wasn't enough for him and asks Malekith to send more Giants and Monsters as a challenge. And warns Malekith by saying that the God of Thunder has arrived. 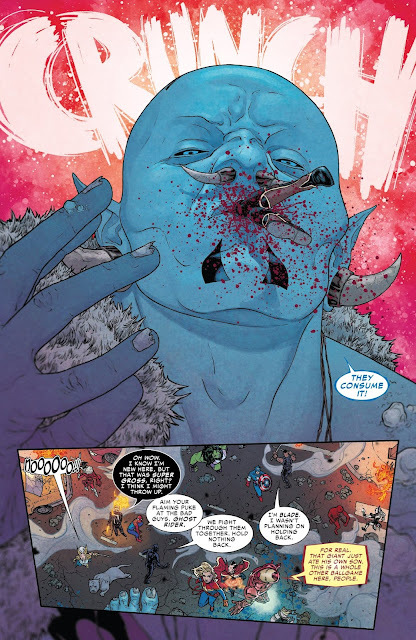 That's all for the first Episode of War of the Realms. I hope you enjoyed it. Please leave your comments, thoughts and reactions down below. Which scene in the episode was the best? For me, the scene in which Captain America throws his shield on Malekith to interrupt him. All Rights to this Comics is Reserved by Marvel Comics. All Images had been removed due to copyright issues.